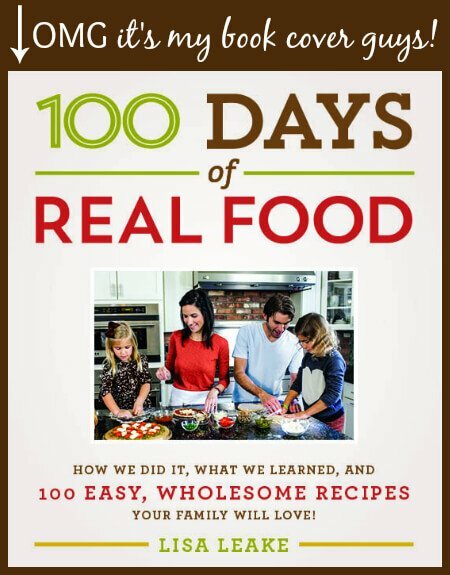 Home » Blog » My Upcoming Real Food Cookbook (out in August)! If there’s one thing I’ve learned in this life, it’s that writing a cookbook teaches you some serious patience! What started as a super exciting (and surreal) opportunity in July of 2012, turned into a super serious undertaking (i.e. actually turning in a finished manuscript by March of 2013), and has now turned into an ever impending release date of August 2014! Some of you may recall that my book was originally going to be on sale starting this month, BUT publisher plans change, and like I said – patience! So if you have been anxiously awaiting the release date (like me), then let me go ahead and thank you for your patience as well…and in the meantime, how about we tide ourselves over with some of the juicy details?! First of all, we have a cover! And it’s even listed on Amazon (and available for preorder!) as if I am a real author or something! In all seriousness though, I can truthfully tell you that I worked harder on this book than I have on anything else in my entire life (even those final exams in college!). So when you buy this book, you are going to get some of my blood, sweat, and tears with it because I didn’t want to just write any real food cookbook, I (i.e. the Type A in me) wanted it to be absolutely perfect for you. I wanted this book to contain all the resources, recipes, and motivation that you could possibly need to completely transform your lifestyle – into a healthy, happy, real food one that is! How to define real food. How to read ingredient labels. How to shop for real food (from eggs to grains to oils to produce) including budget-friendly tips. How to realistically adapt the recommendations to a busy lifestyle. How to get your family on board. 4 new dinner meal plans using the recipes from the book, one for each season! Fun extras like a real food substitution chart, my typical weekly grocery list, entertaining tips, and a school lunch packing chart. 100 (mostly new – not previously on the blog) recipes! 100 full color photos of each and every recipe! Chapters divided as follows: Breakfast, Lunch (including new school lunch ideas! ), Salads and Sides, Snacks and Appetizers, Simple Dinners, Special Treats, and Homemade Staples. I think you’ll especially love the “Homemade Staples” section, which includes a DIY dried onion soup mix, BBQ sauce, cheese sauce, and cream of mushroom soup substitute, among other things. Congratulations! Just went to Amazon to pre-order my very own copy. Can’t wait to see all the hard work you and your family have put into this cookbook / resource. Thanks for helping others with your passion towards healthy eating. I can’t wait to get your book Lisa! You make it so much easier to be healthy in this crazy busy world we live in! I am so excited for your cook book!! :-) I love all of your recipes and you make it so simple. I am defiantly pre-ordering this :-) Thank you for all of your hard work!! Very exciting, congratulations! Looking forward to getting my copy! Can’t wait to get it! I was just telling someone that I’ve learned more from bloggers than “dietitians”. Congrats on the book! Will you be having a book signing in Charlotte — perhaps at Park Road Books? (I am trying to determine whether to pre-order or make my purchase part of a night out with the girls.) Thanks for your great blog. I can’t wait! This sounds perfect exactly what I need!!! Congratulations!!! Fabulous! Just curious before ordering if any nutritional information available? I am sorry it will be so LONG, I want it now! It sounds wonderful and I definitely plan to buy it. Congrats! I can’t wait for it! Congratulations ! I have printed a lot of your recipes and created (your) cookbook already! ;) Will there be more/different recipes in your real cookbook coming out in Augus? And can I preorder it to make sure I get a copy? I can’t wait! Your blog changed my eating habits and the way I look at food.Thank you! Congratulations!! I can’t wait to get my hands on your book, we all enjoy your ideas and recipes so much!! Thank you for sharing your passion with the rest of the world!! So excited for this!!! i bought the 6 weeks lunch meal plan and if its as great as that it will be amazing! Can’t wait for your cookbook to come out! Love your blog and web-site! I just pre-ordered your cookbook on Amazon! It looks wonderful, and I can’t wait for it to be released! I’m so behind on emails that I’m just now seeing this post. Congratulations! I am preordering 2, one for me & one for my best friend. Thank you for all you do!! Love every recipe I have tried!! It’s so nice to be in on this thing together! Our society doesn’t make it easy or the norm. I missed your lunch pack & wondered if you will be doing that again as I would love to purchase it. Last week my son requested your refried beans for his lunch for school!! I love it!! Proud mommy moment for sure! Thanks again! I just preordered!!!!!! Lisa you and your family have changed our lives!!!! I’ve never felt so organized before!!!! I’d even love to buy a compilation of all the recipes here! Excited for the new ones but would love all these online ones in a book too!!!!!! I am so excited about this cookbook! You can bet I will cherish this book and use it until the pages are splattered with spaghetti sauce. I can’t wait to get your new cookbook! I preordered from Amazon about a month ago. There are only a few things I’ll buy in hard bound, as opposed to e’books. I knew I’d want to have a physical copy of this!! So excited to try all the new recipies in the cookbook! Thanks for your hard work to put it together. Peace. Isn’t there a special deal (like a freebie early sample of your cookbook recipes) if we pre-order?? Can’t find your offer! OK, got it – thanks! !